Qué debería esperar cuando se reúna con un abogado de lesiones personales para una consulta gratuita? Cómo eliges al mejor abogado para tu accidente de coche? Puede que te abrumado cuando te conozcas con tu abogado por primera vez. Deberías planear antes de la reunión para sacar el máximo partido de tu tiempo con el abogado. Haz tu investigación de antemano para que puedas elegir al mejor abogado para tus necesidades. Cuánto tiempo has estado practicando la ley? Cómo va a estar trabajando en mi caso? Cuáles son los honorarios legales? Cuáles son tus honorarios de contingencia? Quién paga por los honorarios de testigos expertos? El número de casos que son como los tuyos que han manejado? Puedes proporcionar referencias de clientes anteriores? En qué tipo de ley se han especializado? Cuál es el éxito de los clientes en casos similares? Cuánto vale la lesión que he recibido? Va a ir a juicio mi caso? Con qué frecuencia has ido a juicio? Cuál es el proceso de cómo va a seguir el caso? El abogado de la lesión de Tampa Martin Hernandez está disponible con una simple llamada telefónica. Sólo llama a las 813-229-5353 GRATIS. What should you expect when you meet with a personal injury attorney for a free consultation? How do you choose the best lawyer for your car accident? You may be overwhelmed when you meet with your attorney for the first time. You should plan ahead of the meeting to get the most out of your time with the lawyer. Do your research beforehand so that you can choose the best attorney for your needs. Things that you should bring with you are a detailed account of the accident and any pictures that you took. If you have names and contact information witnesses, your automobile and health insurance information, the other driver’s information including insurance and any medical records relevant to the accident (doctor notes, x-rays or MRI’s). Also any citations or tickets would help. How will be working on my case? Who pays for the expert witness fees? The number of cases that are like yours that they have handled? What type of law have they specialized in? What is the success for clients in similar cases? How much is the injury that I received is worth? How often have you gone to trial? What is the process of how the case will follow? How do you handle disagreements between yourself and clients? Has the attorney ever been censured or disciplined by any legal or ethics committees in the past? If so why? The time and place that the accident occurred. What where the weather conditions? Again if you have the names of witness and what they said, your injuries, treatment and time frame till recovery is complete according to your doctor. How have your injuries affected you (work, at home, Social life)? Give this information to your attorney. You want to select the lawyer who understands all the nuisances of your particular situation, is experienced in the world of litigation and has a track record of winning recoveries for clients. Double check the personal injury attorney’s credentials and confirm that they are validly licensed to practice law in your jurisdiction. You should also be aware that a court can dismiss an attorney if they have a conflict of interest that would impair their ability to represent you. Make sure communication with your attorney does not end after the first interview. That the attorney is not contact with you about the progress in case. Here are some other ideas on how to choose the best lawyer. Why hire a lawyer for your car accident? There are many benefits to hiring a Florida personal injury lawyer if you have been hurt in an auto accident. An injury lawyer takes on the responsibility of dealing with the insurance companies and finding insurance coverage for the injured party. Also, you will not have to continue to receive constant phone calls or misleading questions from the insurance company. 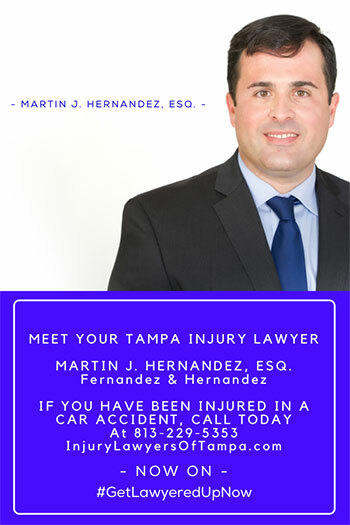 How Can Tampa Attorney Martin Hernandez of Fernandez & Hernandez Help Me? Dedicated to protecting the people, not the powerful who put profits over people, Fernandez & Hernandez established itself as a leading personal injury law firm that seeks the best recovery for the client. Our attorneys in Tampa have played a vital role in the firm’s success, recovering millions on behalf of their clients. Our lawyers work on a contingency-fee basis, meaning they only get a fee if they successfully win your case, with the fee usually being a percentage of the settlement. Until then, you don’t have to deal with costly hourly fees, and you still get the vast resources we offer. Also, since we don’t get paid until you get paid, we want to move your case along and obtain the highest recovery on your case.